Google has once again lengthened their shortlist of cities that could someday soon see Google Fiber service. If all the plans pan out, the next expansions will come in California and Kentucky. 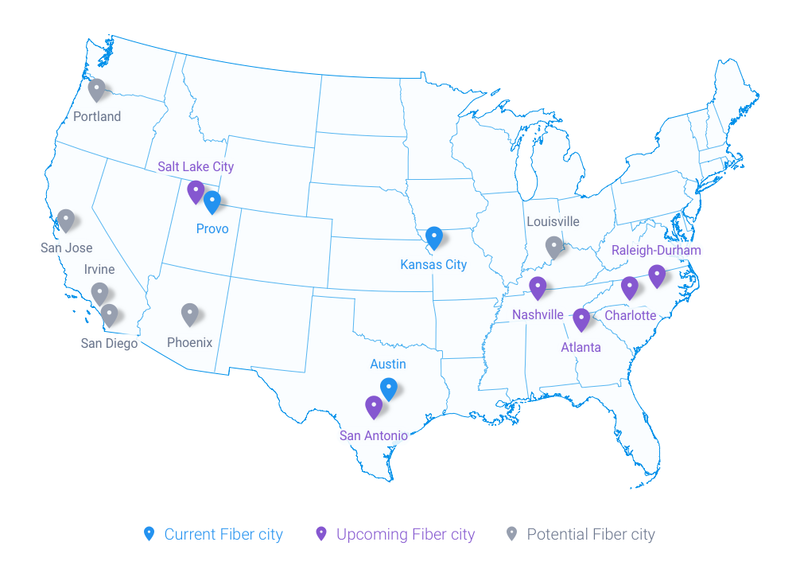 Google announced this week that their Fiber division has added three more cities to the “potential” list: Irvine, CA; San Diego, CA; and Louisville, KY.
As Google terms it, they have “invited” those cities to “explore bringing Google Fiber to their communities.” That kicks off a planning process in which local officials — “strong leaders at city hall” — get to demonstrate to Google that they can roll out the right incentives, including tax breaks and various infrastructure rights, to make installation cheaper and faster. Currently Google offers Fiber service in Austin, Kansas City, and Provo. Salt Lake City, San Antonio, Nashville, Charlotte, Atlanta, and metro Raleigh are all on deck to get theirs hooked up in the not-too-distant future. And the rumor mill says that Portland is likely to be the next lucky locale to flip on the map above from maybe-grey to promising purple. Even if Google Fiber does not come quickly to the cities on the shortlist, even being considered is probably a good thing for local subscribers. Google’s presence in various markets has — totally coincidentally, we’re sure — led to Cox, Comcast, Time Warner Cable, and AT&T either increasing speeds, reducing costs, or both for local customers. Previous Would You Pay $200 For A Machine That Only Brews Single Servings Of Tea?